I believe in part it was to do with CJ's second witness statement..
police passed these suspicions on to themedia. It was on the 22nd December 2010 that CJ gave this second witness statement... On this day we have the Launch of The new 'Missing Poster" with "Operation Braid" at the bottom.... This is 2 days into a "Missing Persons Inquiry".. I believe we need to question what Operation Braid was really about.... Because it was never about a "Placid Dutchman" who happened to be a neighbour of Joanna Yeates. Good distraction tactic though, locking something or nothing up for 84 years, bound to focus a certain amount of attention away from the very thing you are trying to hide. Thing is it’s a public road and footpath in the middle of Clifton, hearing people is not that unusual. Could have been anything or anyone. The fact that the focus of the police turned to CJ after advising the witnesses to call if they remembered anything else just serves to show how their simple drilled minds follow simple drilled procedures and just how two faced it is possible to get. If you end up against one of the idiots after he finked he finked about sumfink anything more than the simplest explanation is likely to earn your arrest simply because his brain isn’t going to sort this one out in a hurry. Odd how heavyweight it got in minimum time, some big players in there right at the beginning, big players indeed. Have you already mentioned that Braid is a simple anagram of “A Bird”? A simplicity rather in keeping I would suggest. I am familiar with the National Archives, as I am a (very amateur) genealogist, and I have been there on numerous occasions. I know it is usual to close records for a number of years----often 100. This is even true of censuses---this is why the last one to which we currently have access is the 1911 one. We won't have access to the 1921 census until 2021. It is something to do with protecting the confidentiality of people who might still be alive. BUT, is it usual to close records that are connected with murder enquiries? That I do not know, and I cannot see why they would need to close somebody's witness statement. Can anyone enlighten us? is this usual? Operation Braid.. happened as early as the 21st December 2010 Which for a person only being reported Missing the day before, makes you wonder what reason they had to give an Operational name to a Missing Persons Inquiry?? Why are the CID involved in a "Missing Persons Inquiry"??? They deal with serious crime.... What was apparent to the Police from the moment that they were contacted in relation to Joanna Yeates disappearance?? Another thought I had... Is "Operation Braid", still in Operation?? From Avon and Somersets website..
To report a missing person call 101 or visit your local police station. If it is an emergency and you feel that the missing person may be at risk of immediate harm, dial 999.
or at home, recent changes in behaviour that is out of character. Were all these details given in the phone call to the Police when Greg Reardon called?? How long was the phone call to the Police on the 20th December 2010?? Was this entire phone call played in court?? I think someone needs to question Avon and Somerset Police, and ask them why a Missing Persons Inquiry was headed by the CID and what made them give it an Operational Name by 21st December 2010... When as we know Gaia Popes disappearance of over 1 week didn't have an Operational name and 3 people in that Inquiry were arrested on suspicion of Murder! We would like to thank the police liaison officers, Emma and Russ, for their consideration towards us and as far as they could keeping us informed of developments. We would also like to express our appreciation to the members of Operation Braid for giving up their time, especially over the festive period, and their efforts in apprehending Jo's killer. When questioned in court, Chief Inspector Sonia Davies (pictured above), stated that “obviously, we want to gather information, but that’s different to intelligence.” “Intelligence”, according to Davis, was narrowly defined as “information that has come from police sources and is acted upon”. The other part of the quote which initially gained my interest was..
Because why would they be giving up their time ????? What connection could there have been between Joanna Yeates and an Operation called "Operation Braid"??? So what is Operation Braid ?? Is it the name of an Operation looking into Cold Cases like Glenis Carruthers or Melanie Hall for instance ???? Where would Dr Vincent Tabak fit into this Operation??? Question... Is Operation Braid still in Operation?? Or was it still in Operation after the conviction of Dr Vincent Tabak?? (B): The Joanna Yeates Murder Inquiry ???? This idea of Operation Braid being an ongoing inquiry into a wider investigation lends itself very well into our inquiry. The simple association of another murder may well have triggered an immediate response from a dedicated team hence the reason you have an immediate input from higher up the food chain..
Why would a Senior Police Officer Inform CJ, that they had been 2 arrests after an internal Inquiry??? Why did Colin Port inform CJ of what was taking place in an Internal Inquiry??? There was no need for Colin Port to give this information to CJ..(imo).... Did CJ know Colin Port?? "Operation Braid".... leaked so much Information to the press, yet it was denied at The Leveson that it had happened.. But does CJ's statement to The Leveson support that the leaking of Information was known about??? And does that mean that the information that was leaked was correct?? The real problem I face, is trying to understand what possible act these two individuals committed as to have been arrested within the Inquiry???? And was it "just" in conjunction with CJ?? Or was it wider reaching within "Operation Braid"?? On the second Clip of Longwood Lane at 1:32... Emma follows Greg and Frank Reardon to the side of the van.... Now I can see no purpose for this unless she is covertly recording what is being said at Longwood Lane....9imo)..
Now my next question is why is it that frank Reardon is driving Greg Reardon to and from this Crime Scene ??? At 3:18 (image 2:) We see Frank Reardon getting into the drivers side of the second vehicle.... Russ and the Officer in charge are both talking to Frank Reardon , before Greg Reardon climbs into this vehicle... Now this is my issue.... What Role did Frank Reardon play in this Investigation??? Does the fact that Frank is chaperoning Greg to and from this scene suggest he has to be involved with the police in some capacity for them to let him drive his vehicle onto Longwood Lane and be the main driver??? Which ones the boyfriend?? Is the boyfriend the one on the far left? What role has Frank Reardon got in this Investigation ?? Is it possible that he was an under cover detective?? Is it possible that he actually worked for the Police ?? It is something worth considering.. especially as he was allowed to drive a vehicle to and from a "Crime Scene".... !! If Frank Reardon is Greg Reardons alibi witness... why would you allow an alibi witness so close to a "Crime Scene"???? Shouldn't he have been kept away from this part of the Investigation and not dropped right in on Longwood Lane.... If they were still Investigating the Longwood lane area at this time and we know that they were... why would you have anyone contaminating that area???? Has no-one even thought about this?? Frank Reardon should not have been allowed anywhere near Longwood Lane (imo) They hadn't finished Investigating Greg Reardons alibi as far as I can tell... and things in relation to what has been said at anyone time can change and do change.... So why bring Frank Reardon to Longwood Lane before confirmation has been given to the cause of death of Joanna yeates ??? 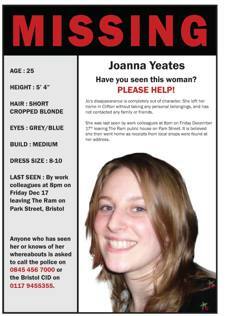 They only apparently discover on the 28th December 2010 that Joanna Yeates had been Murdered.... So how can they possibly rule Greg out on the same day when they had only just discovered that Joanna Yeates shad been Murdered??? Wouldn't they look again at his alibi and make sure that everything he said was accurate??? Which still beggars the question as to why Frank Reardon Greg's alibi witness was allowed to attend Longwood Lane the day before we are informed of how she died?? ITV News.. Is Greg Reardon a suspect? No he's a witness in this Investigation. Yet they seem to have everything battened down by the time they reveal that she has been Murdered.... Should the 28th December 2010 be the start of the Murder Inquiry?? And not a day to rule anyone in or out of This Murder Inquiry so soon.... Especially as they had only just received the information that she had been Murdered!! What is the man we know as Frank Reardon's role into The Investigation of the Murder of Joanna Yeates ??? Is he a Police Officer or Police Staff?? What and Who is Frank Reardon???? I keep watching that clip at the point where Frank slams the door of the car... He just looks mega pee-ed off to me.... And never communicates with his brother at all in this short clip... Not even eye contact!! Police stop vehicles on Longwood Lane in North Somerset - near to the spot where the body of Joanna Yeates was found, during an appeal for information regarding the murder of the architect. image 1: Same as posted with information available to see. I am starting to wonder if that is the car park behind Joanna Yeates house??? And the building you can just about make out is in fact the modern building that is opposite what we know as Flat 2??? "Percival Road" you would need to access to get there.... Now if that doesn't ring bells I don't know what does !! It looks a bit like the entrance to the woods on the other side of the road to the quarry, but I'm not sure. There is a car park of sorts there, although I don't recall whether it has marked bays. Not sure about the door----is it definitely a door?